We made our LEGO Pirate Ship in the days leading up to our stay in a Pirate room at LEGOLAND Windsor. It was an adaptation of RedTedArt’s Pirate boat. We made it smaller than the original because we didn’t have big enough pieces of card, and I also believed it would make it a much nicer size for our LEGO Minifigures. This followed on from a lesson in measuring where The Sensory Seeker made a life-sized Skeleton of himself. My older son (aged 7) had decided to skip this session, although had attended the original measuring one. I thought it would be good for him to see how maths and measuring could be of use to him in his everyday life. First I printed off the instructions from Maggy’s site. I asked my son what did we need to do to halve the measurements, and he told me that we would divide it by 2. I was really impressed as he set to work in dividing all the measurements – not even being phased by decimals. He then measured out and drew onto the card the pieces he would need. When the pieces were all drawn they were cut out. I learned a valuable lesson in reading all the instructions properly, but nevertheless we put the ship together ok. We secured it with magic tape – and only then realised that we hadn’t cut out any holes first! Then he had great fun finding exactly the right stick in the garden for the mast. In fact the one he found had a bump in it that we decided that later on we will make a nest for the ship too. Next we set to work covering it in paper mache – on the inside and out to secure it. Once the paper had dried we painted it blue. But this did not look right and we painted over it black. In retrospect I think this gave it a good effect where the blue pokes under the black. 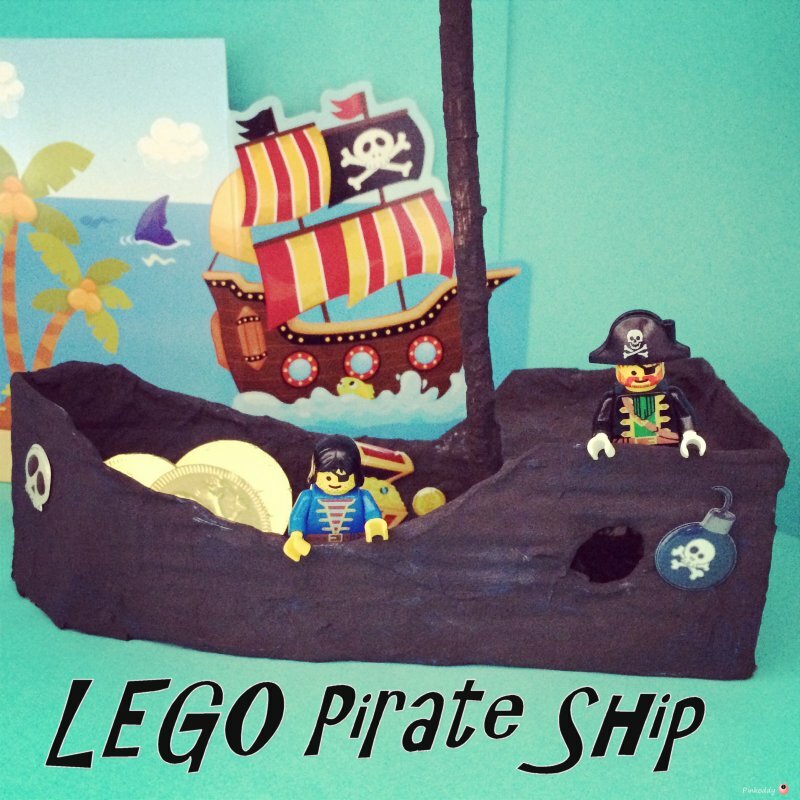 We added our Pirate LEGO Minifigures and then found some Pirate stickers and gold coins to put on/in the ship. What I love about the internet is that you can take whatever interest your child has at the current moment and find some wonderful things related to it by just doing a quick search. There’s some amazing crafts for kids. Take our interest in Pirates, for example. Originally we did a few pirate things due to the Pirates and Princesses parties the boys were invited to – such as making our own Pirate Cutlass out of newspaper. 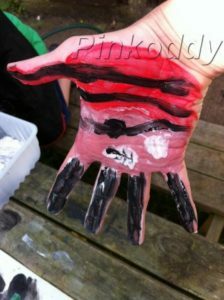 Then we made a Pirate handprint when teaching my year 2 (then a pre-schooler) the alphabet. Then we played the game The Pirate Captain Says and went on a Pirate Treasure Hunt. That looks great! My youngest would have loved that for hi Lego Pirates. I much prefer this idea having spent hours upon hours over Christmas building Princess castles, carriages and more, only for Liv to destroy them in moments *cry* Great idea! Fabulous! I think he selected the perfect stick for the mast too. This is something my son would love. Think I will try this with him. He is very much into making things from cardboard etc we have in the house. Joy this looks amazing! I haven’t done any craft with the boy for ages so maybe we will give this a whirl-looks awesome. This looks lovely and beautifully crafted. The treasure chest is brilliant as is the ship! Love the egg box treasure chest! This is great – my three are really into Lego…and my youngest loves pirates! Love the links, thank you. What a great idea, and the finished product looks fab! Very clever. That looks fab! Think Syd would love to have a go at one! Looks great. I know N would love the idea of making his own pirate boat (saves me spending extortionate amounts on buying one too!). Love the pic of the egg box treasure treat too. Just one word – awesome my dear, as always. 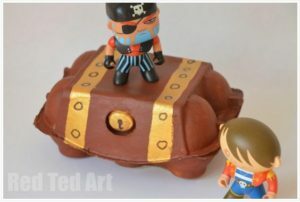 My boy LOVES his pirates, so this would be great for him. Thx again for linking up to the parenting pin it party on our 100th birthday.